Some 13-Year-Old Kid Shredded Face at the 2018 Olympic Closing Ceremony. Who Is He? Who doesn’t love watching the Winter Olympics? There’s snowboarding! Luge! Drama! (Are those ice-skaters dating or just really, really convincing?) Someone sang Rihanna? 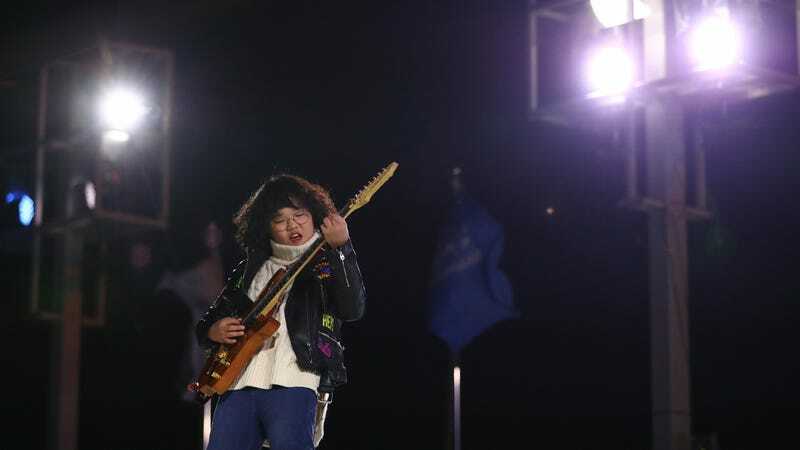 The closing ceremony of the 2018 Olympics games in PyeongChang, South Korea Sunday night was every bit as mesmerizing—and the star of the show, by a long stretch, was a spectacled, curly-haired teenager playing electric guitar. He crushed it, surely inspiring regret in any viewer who dropped after-school guitar lessons in the seventh grade. Joke’s on them, though—because Yang Tae Hwan is only 13 years old. He was learning to shred face way before middle school, and would probably put you to shame today, even if you stuck with those junior high sessions. The announcers also mention, around the 3:40 minute mark, that Yang portrayed a young version of one of Korea’s most famous rock stars, Cho Yong Pil, on a K-drama series. Yeah, I didn’t think I could be more obsessed with him, either. For the Olympics closing ceremony, Yang played a version of “Winter” from Italian composer Antonio Vivaldi’s arguably most famous work, The Four Seasons. It sounds incredible, and he also looks the part: wearing a leather jacket studded with colorful patches and a serious turtleneck. Dude means business. Honestly, I would watch an hour of this. Thankfully, you kinda can: There are tons and tons of videos on YouTube of him playing the guitar, everything from “My Sharona” to “The Sultans of Swing” to “Beat It.” The Olympics may be over, but Yang’s time to shine is just getting started. Shred ‘til you’re dead.